It was a standing room only crowd for his presentation on the incidence, mortality, diagnosis and treatment of pulmonary embolism. Dr. Cueto reviewed the incidence of pulmonary embolism which occurs approximately 909, 753 times a year in the United States, with an estimated 296,370 deaths directly attributed to this phenomenon (2005, Journal of Thromboembolism & Hematology). In a recent study at the Institute of Cardiology in Mexico City by Sandoval, 22.4% of all autopsies showed evidence of pulmonary embolism. 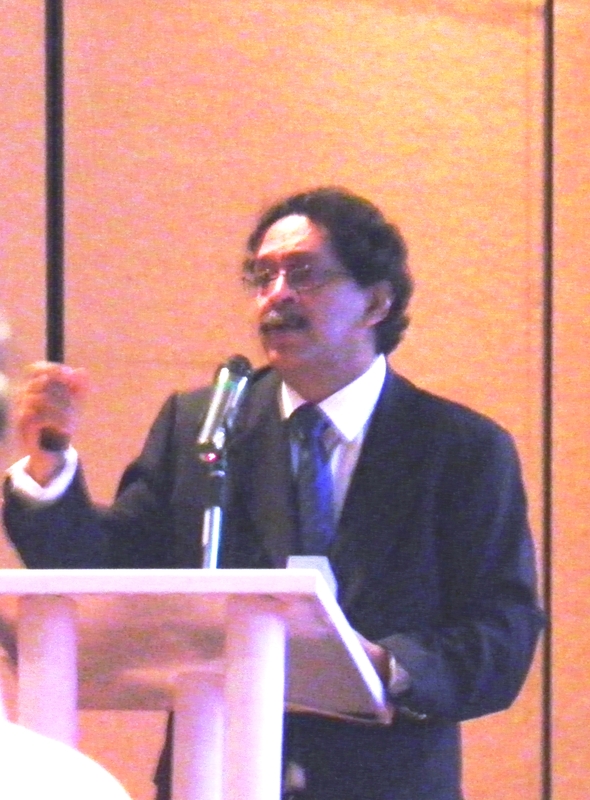 While many of the risk factors are well-known cardiovascular disease risks (obesity, hypertension, diabetes, smoking, elevated cholesterol) as well as traditional risk factors such as cancer/ malignant processes, venous stasis/ immobility, recent surgery and airline (or other travel) greater than two hours – Dr. Cueto discussed how pulmonary embolism is often overlooked. He reviewed the existing criteria for predicting embolism risk such as the Wells, Winky (Geneva) scores, as well as the shortfalls of each of these scores, which often rely on subjective criteria on the basis of the individual applying the criteria. He also talked about a recent paper suggesting a strong correlation between ST changes in aVR and presence of a right BBB in addition to the traditional S1Q3T3 finding on electrocardiogram. He states that the strength of the D-dimer is not in it’s diagnostic capability but in it’s prognostic ability, as the elevated values at specific thresholds can be used to correlation both the location and risk of mortality. Despite the advent of multi-modality imaging studies the gold standard remains the V:Q scan which is the only diagnostic tool to clearly rule out the presence of pulmonary emboli, along with the advantages and disadvantages of traditional and helical CT scans in addition to MRA (magnetic resonance imaging with angiography.) He reports that initial enthusiasm for MRA has dampened due to multiple limitations in use as well as poor picture quality in comparison to other modalities. The main limitations of the multi-detector helical CT scan remain the inaccessibility and unavailability of this modality at many facilities due to cost. He also reviewed the recently published guidelines from the American College of Chest Physicians (Chest, 2012) include very specific recommendations including initiation of thrombolytic and anti-coagulant therapies prior to formal or radiographic diagnosis in patients at high risk despite their classification of evidence as 2C. These changes come due to recent studies showing adverse outcomes with delayed onset of treatment, with a marked shift around the twenty hour mark after the onset of the initial thrombotic event. As he mentioned previously, since the majority of patients may demonstrate either vague or absent symptomatology on the onset of massive pulmonary embolism, these guidelines attempt to streamline and advance treatment that may be otherwise delayed by diagnostic testing. (2012). Antithrombotic treatment of venous thromboembolism. ACCP guidelines. Chest, 2012, supplement, 141(2) e4195 – e4945. (2009). Air travel and risk of thromboembolism. Ann Internal Medicine 151 – 180: 190. Review of the literature showing an 18% increase for every two- hour interval of travel. Sounds like a great lecture!